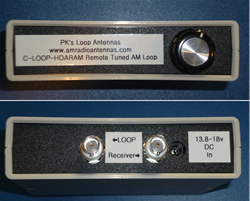 PK’s Loop Antennas have Engineered an optimised Wideband AM Hi-Fi Antenna for Metropolitan use known as the "Matched Loop Antenna". It provides outstanding AM reception results from your AM Tuner, solving the age old problem of poor AM performance otherwise obtained with the Mini-Loop that tuners are shipped with. It will dramatically improve the Signal to Noise Ratio on your AM reception. Hearing is believing ! Suits, SONY, PIONEER, DENON, YAMAHA and most other tuners. Is your signal Weak ? This is an Indoor Amplified Antenna for Weak AM Signals, it is for connection to many types of AM Receivers and Radios with antenna terminals including; Some Hi-Fi's, Valve Mantles and Car radios. Conveniently powered from any source of 12 Volts DC. Features our unique Shielded Magnetic design for the clearest in long range AM reception. Accessories available; AUS/NZ 240v AC plug-pack for home or indoor use. Automotive fused cigarette lighter lead, external battery lead option. Various cable types, including Car Radio, Hi-Fi & Open ends. Optional Loop Coupler, for radio without external antenna connections. Are you having difficulty getting AM Indoors ? The powerful combination of an Electronically Balanced Loop and isolation from powerline noise, gives the qualities necessary to decrease local interference, noise and static, leaving strong and clear reception. The Loop Control Box has an easy to use tuning control and connects to the loop with a single coax cable. The system is powered by a 9volt battery located inside the control box; ultra low power consumption means you will only need to change the battery about once a year, a bit like a Smoke Detector Battery. It is truly the ultimate Outdoor AM Radio Antenna ! This antenna can be used with HiFi Tuners, AM Receivers, Car Radios. We can modify the Sangean PR-D7 Portable Radio for an External Antenna connection, it will thrive on the signal from this antenna in fringe applications !!! Need to Amplify your AM Signal ? Use this Outdoor Amplified AM Loop when you live on the fringe of AM reception and need that extra signal boost. 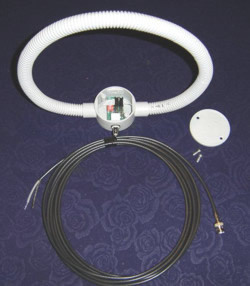 This is a powered Loop Antenna, the Control Box has a simple tuning control and connects to the loop with a single coax cable. The system is powered by from 12-18v DC, for AUS/NZ, a 240v Plugpack is available. It is truly the ultimate Outdoor Amplified AM Radio Antenna ! This antenna can be used with HiFi Tuners, AM Receivers, Car Radios.